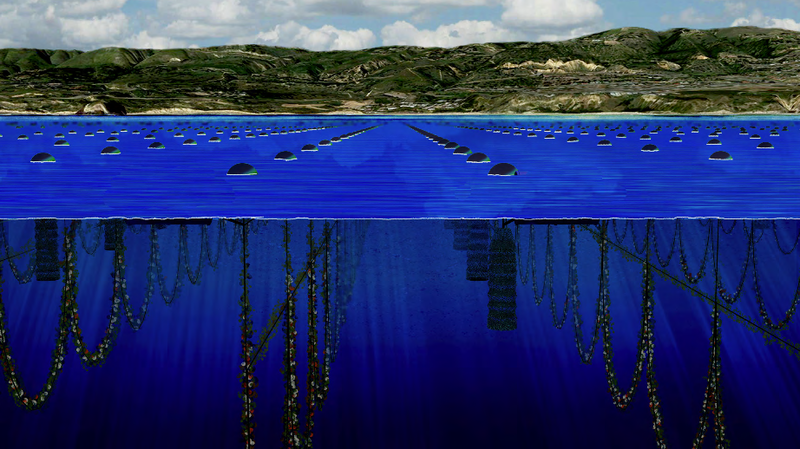 Rendering of KZO Sea Farms’ future open water shellfish farm. Photo courtesy of KZO Sea Farms. Phrases such “aquaculture policies,” “mariculture parks” and “offshore shellfish cultivation” might be foreign to most Americans now, but if a new oceanic seafood farm project proves successful, they could become key elements of the local sustainable food movement. 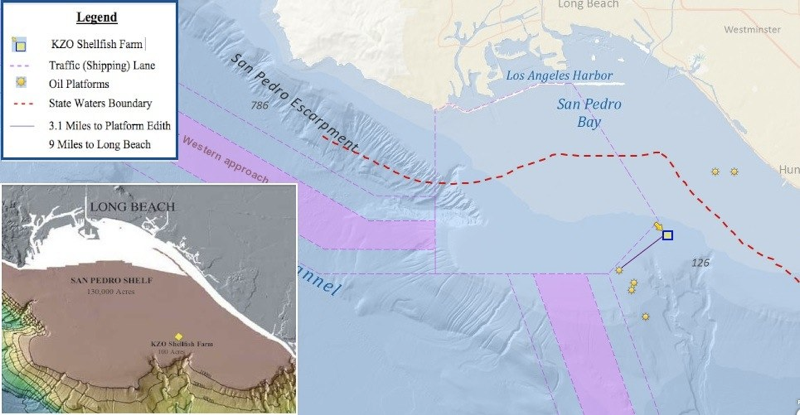 Earlier this week, the US Army Corps of Engineers issued a provisional permit allowing KZO Sea Farms to begin construction and operate a shellfish farm nine miles off the coast of Long Beach, the first in Federal waters. Soon, KZO will establish a 100-acre bivalve to grow and harvest 100,000 pounds of Pacific oysters and Mediterranean mussels which will hopefully be sold to distributors and restaurants across Southern California by the end of 2013. Typically, shellfish are harvested onshore—in intertidal bays or estuaries—but space is limited in these environments and the gap that is left between production and consumer need is often filled with imports. The new open water shellfish farm will reduce the need for importing seafood and its concept guides other producers towards a model of self-sufficiency in American food production. Open water shellfish farms have been successfully used by other countries for years, but until recently, there was no framework in place for American permitting and regulations. Spurred by the National Oceanic and Atmospheric Organization’s recently released national marine aquaculture policy (which outlined the agency’s policies on fish farming), KZO embarked on a lengthy and arduous process to obtain approval for its farm. And it’s hopes that this groundbreaking off-Long Beach project will be able to set an example for the state’s future role in sustainable aquaculture.